ST. GEORGE — There are two documents of paramount importance to American history: the Declaration of Independence, which forged our national identity, and the United States Constitution, which set forth the framework for the federal government that is still in use today. The Daughters of the American Revolution (DAR) initiated the observance in 1955, when the organization petitioned the U.S. Congress to dedicate Sept. 17–23 of each year to the commemoration of Constitution Week. Congress adopted the resolution, and on Aug. 2, 1956, President Dwight D. Eisenhower signed it into Public Law #915. The celebration’s goals are threefold: to encourage the study of the historical events that led to the framing of the Constitution in September 1787; to inform people that the Constitution is the basis of America’s great heritage and the foundation of our way of life; and to emphasize U.S. citizens’ responsibility to protect, defend and preserve the Constitution. 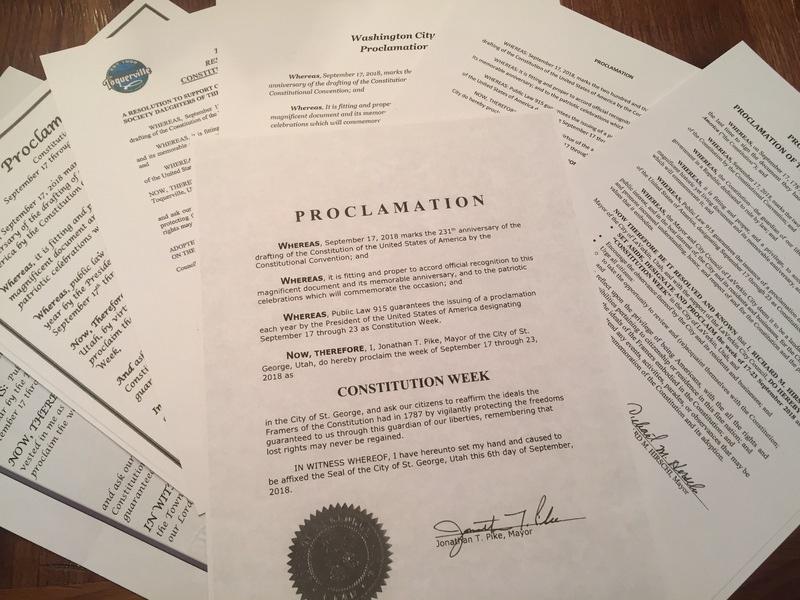 DAR has been the foremost advocate for the awareness, promotion and celebration of Constitution Week. This annual observance provides innumerable opportunities for educational initiatives and community outreach, two mission areas of crucial importance to the National Society’s work. in their respective cities. They are Hurricane, Ivins, LaVerkin, Leeds, Santa Clara, St George, Toquerville and Washington. Last year the chapter received five proclamations, which was a new record at that time. One of the largest patriotic women’s organizations in the world, DAR has more than 185,000 members in approximately 3,000 chapters across the country and even in numerous foreign countries. DAR strives to promote historic preservation, education and patriotism via commemorative events, scholarships and educational initiatives, citizenship programs, service to veterans, meaningful community service and more. For additional information about DAR and its programs, visit www.dar.org. For information on Utah State DAR chapters, visit www.utahdar.org.